A US police photographer has leaked images of Boston Marathon suspect Dzhokhar Tsarnaev during his capture in anger at the picture used by Rolling Stone magazine for its next cover. Police Sgt Sean Murphy said his photos showed "the real bomber" - the magazine cover was "hurtful" to the victims' memories and their families. The images, given to Boston Magazine, show him with the red dot of a sniper rifle's laser on his face. The bombings killed three people. More than 260 were injured in the two explosions at the marathon finish line on 15 April. Mr Tsarnaev is also accused of the murder of a fourth person, a university police officer, who was allegedly shot dead by him and his brother Tamerlan in the days after the attack. 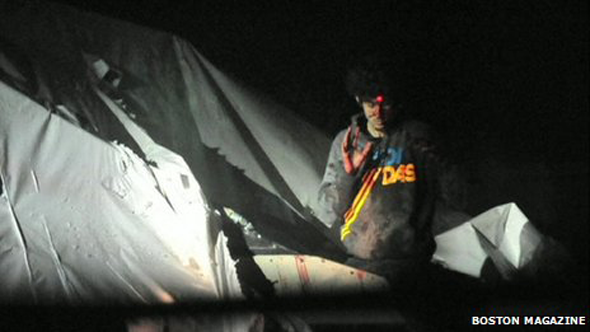 The pictures were taken when Mr Tsarnaev, wounded after a gunfight with police, was found hiding in a dry-docked boat in a residential garden. A spokesman for state police said the release of the photos had not been authorised, and they would not be given to other news media. The spokesman also said Sgt Murphy, a police photographer, was subject to an internal investigation. A tweet from the author of the Boston Magazine article said Sgt Murphy had been "relieved of duty". The police photographer told the magazine he released the contrasting images of Mr Tsarnaev as a response to the Rolling Stone cover. The latest pictures show the "real Boston bomber, not someone fluffed and buffed for the cover of Rolling Stone magazine", Sgt Murphy said. "These were real people, with real lives, with real families," he said in a statement. "And to have this cover dropped into Boston was hurtful to their memories and their families." 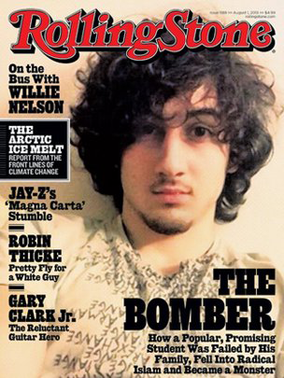 On Wednesday, Rolling Stone defended its decision to put Mr Tsarnaev on the cover, saying it was committed to serious, thoughtful coverage.